The Construction attorneys at Schlueter, Mahoney & Ross, P.C. handle clients involved in construction projects, large and small. Throughout the years, our Construction lawyers in Denver, CO have represented many participants in the building and construction industries, including owners, developers, engineers, architects, contractors, and subcontractors. We represent clients in litigation in various state and federal courts, as well as in arbitration proceedings and mediation conferences. Schlueter, Mahoney & Ross, P.C. 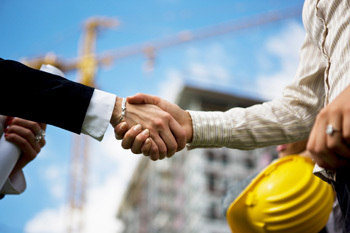 can provide the kind of construction lawyer Denver, CO builders have come to rely on. Schlueter, Mahoney & Ross. P.C. has been successfully serving the Denver area for over two decades. We handle individual clients as well as corporate clients and specialize in cases of non-payment for work that has already been completed. Our goal is to advise our clients on the ways to diminish the possibilities of risks and conflicts throughout the course of any given project. When such conflicts have already taken place, our Construction Defect Lawyers in Denver can work hard to provide practical solutions for a prompt resolution that protect our client’s interests. A major facet of construction law is contract claims. Contract claims may include such aspects as extra work (change orders), delays, interferences, lost productivity, defects, and non-performance. Our firm works in the preparation and defense of such claims. Since construction projects so often involve more than just two parties, the likelihood of dispute is higher. Our Construction Defect Attorneys in Denver can assist in the resolution of such cases, from simple two-party disputes to more complex disputes involving multiple parties on major private and public construction projects. Schlueter, Mahoney & Ross, P.C., can provide the kind of construction Defect Attorney Colorado laborers, contractors and sub-contractors need for such claims. Similarly, our Construction Defect Lawyers in Colorado maintained a substantial practice in the area of surety law for fifteen years on both public and private projects. Schlueter, Mahoney & Ross’s surety lawyers are actively involved in negotiations with project owners, creditors, and financially troubled contractors during all stages of the construction process. Our surety lawyers have expertise in matters concerning default, project completion, and financing arrangements. Please use the contact information on the lower left side of this page to learn more about our services.